These days a New Order gig carries a genuine sense of occasion. Last year the band played five hometown shows in Manchester, accompanied by an electronic symphony, each delving into the different eras of their back catalogue. Tonight might be a more straightforward playing of the hits, but it’s the band’s only 2018 UK show ... and they’ve got some treats up their sleeves. The first of those drops just four tracks in. Introduced by Stephen Morris’ brisk drumming and an itchy baseline from bassist Tom Chapman, it takes Ally Pally just seconds to recognise Joy Division’s ‘Disorder’, a song the band have been revisiting since last year for the first time since 1980. The Factory Records veterans are clearly in the stage of their career where they’re embracing their entire discography and many of the deep cuts and more esoteric tracks unearthed during last year’s Manchester gigs have also made it into tonight’s set. Lasers fill the air amid retina-popping, big- screen imagery as the neon, house-inflected ‘Vanishing Point’ and the sticky bass of ‘Ultraviolence’, both played only a handful of times since the 80’s, have the crowd reliving their Hacienda days in oven-like conditions. 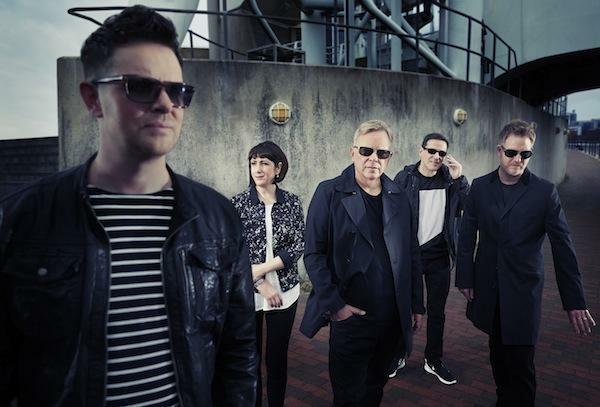 Out front, 62-year-old singer Bernard Sumner is the band’s perennially boyish focal point. His hair might be a certain shade of silver these days, but his vocals have a strangely ageless quality. He says very little between songs, and what he does say is typically droll, for instance branding all-out modern banger ‘Tutti Frutti’ “quirky”. But there’s no mistaking his delight watching the 10,000- strong crowd go increasingly wild with each track. And rightfully so, its nights like this that remind us just how many zingers New Order have in their arsenal. The wistful jangle of ‘Regret’, a glorious ‘Bizarre Love Triangle’, ‘Your Silent Face’s shimmering veil and a superb ‘Crystal’ are all delivered with unbridled joy. ‘Blue Monday’ is iconic, timeless and sounds as ahead of its time as it did almost four decades ago. A reworked, extended and dancier ‘True Faith’ is the set’s only dip, losing some of the magic of the original version. The evening ends, as it should, in tribute to Joy Division. Sparkling synth epiphanies are replaced by cathedral-sized magnificence, starting with an anguished rendition of ‘Atmosphere.’ During absolute evening highlight ‘Decades’, stark black and white footage is projected onto huge screens, the image of Ian Curtis’ face a sharp contrast to the preceding explosion of colour. Of course Sumner can’t hold the same weight as Curtis’ haunted vocals, and it shows particularly on closer ‘Love Will Tear Us Apart’, but that’s OK. New Order aren’t out to tap into old pain. Tonight is a celebration of innovation, fabulous tunes and a career that has mined gold from tragedy.